Inside, the air smelled distinctly of sugar, and the scene was like a peripatetic cocktail party. People with all manner of agendas–from diehards to newbies to blow-ins to those happy to score free food–were milling about oohing, aahing, tasting, chatting and comparing cupcakes of all shapes and sizes. Fair to say, chocolate/maple/bacon was one recurring theme. 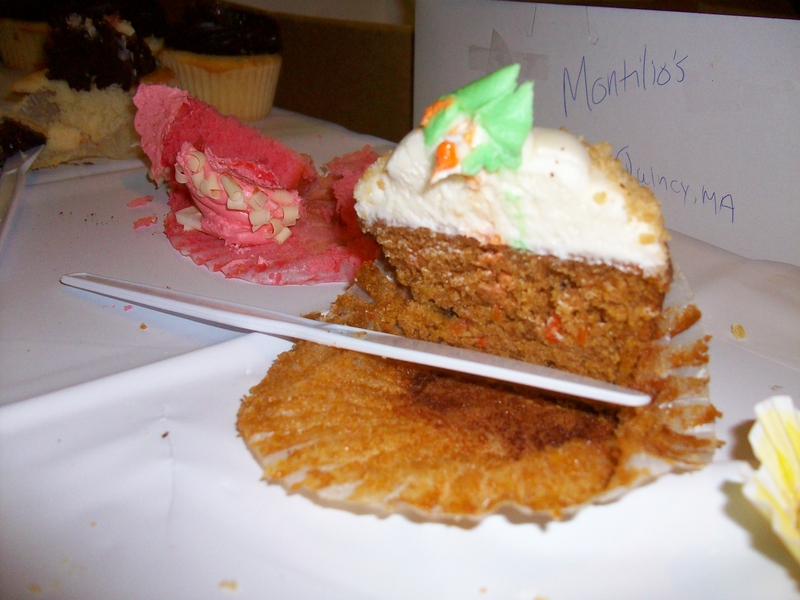 A number of campers said they were on the hunt for carrot cake cupcakes. 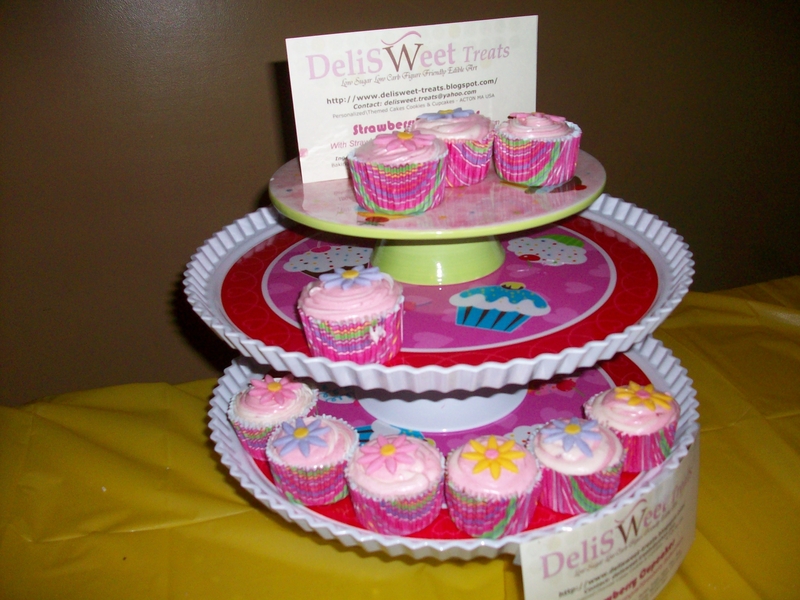 Party Favors’ raspberry vanilla cupcake churned the rumor mill and were soon gobbled up. 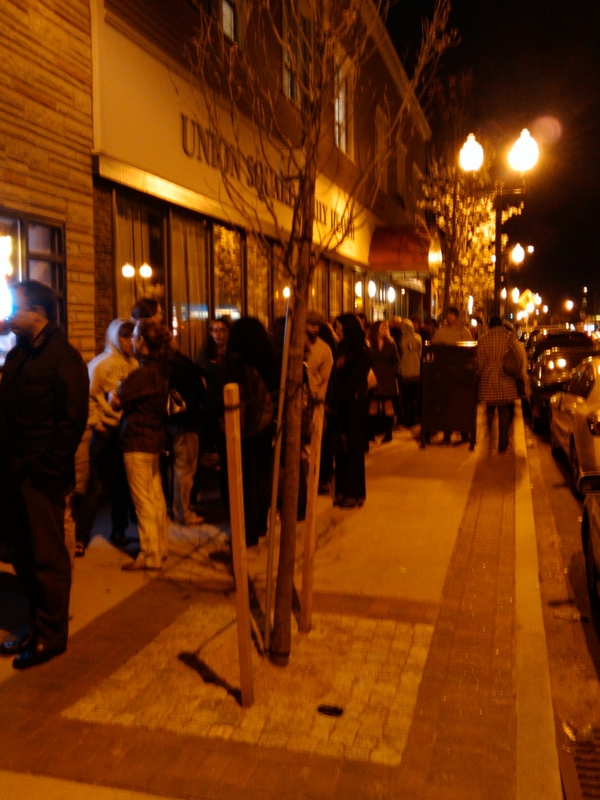 The peanut butter and jelly version by Sugar of West Roxbury was also a-buzz, but even Debbie nearly ran out–quite a feat when you bring 300! I tried the mint chocolate cupcake of “Cupcakes by Emma” (heavy on the frosting but she nailed it, with a perfectly proportioned hint of mint), the brown sugar-based Archangel Gabriel cupcake proffered by Eric Bertelsen of Sin Cupcakes that had a mop of coconut on top (fabulous, and so were Eric’s Ultimate Sin red velvet treats that Sarah tried). 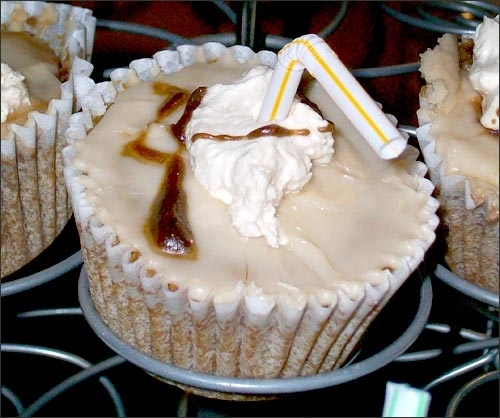 I also sampled the vegan Rootbeer Float cupcakes with rootbeer reduction by “Home Fries”–yep–that was SWEET. Among the ones Sarah tried and liked, the Boston Cream Cupcake by jenna CAKES was a stand out. She also dug the tidy-looking chocolate cupcakes topped with maple frosting and brown sugar-candied bacon created by Erika, a graphic designer, who said she was experimenting with a new recipe and had come to share her stuff and get ideas. Toward the end the evening, about 9 PM, Sarah and I decided to interview the last people in line. Who were they? Get this: a really friendly couple from Kansas (Kansas! ), newly married, making their way from dinner in Union Square back to their hotel. And what did they stumble upon, unbeknownst to them? Dessert! Free! Virtually no wait! As they worked their way through their first round of cupcakes, we joked. Good thing Cupcake Camp wasn’t held Sunday night. Both of them are running the Boston Marathon. P.S. 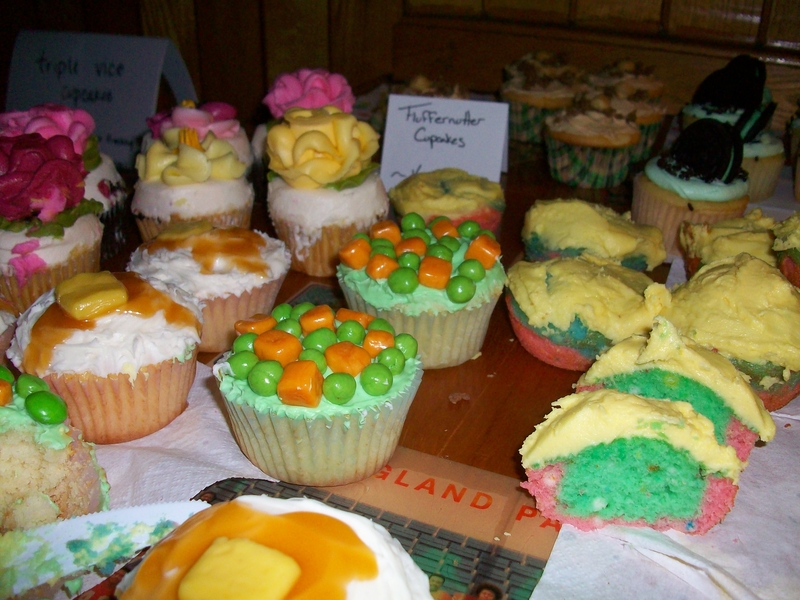 Keep your eyes and ears peeled for “Cupcake Camp: Part II” with audio slide show. There’s a lot still to tell about this extraordinary evening, including organizer Anita’s plea “Please don’t kill me!” and the dearth of napkins. This entry was posted in Public Radio Kitchen on April 16, 2010 by . I was there! Thanks for the interview and trying my CMB’s (chocolate maple bacon)!! I thought it was a cool event, I think next time it needs to be in a bigger venue! And definitely more napkins. The one other cupcake i saw with bacon on it from Cherry Bomb Bakery was awesome! the cayenne in the frosting was a nice contrasting flavor. When can we expect part II of the recap?! Thanks for kind comments and picture .